CONSTANTI-NVSIVNNC [CONSTANTINVS IVN N C]; bust l., laur., cuir., Victory on globe in r. hand. VIRTVS-EXERCIT [VIRTVS EXERCIT]; trophy with captive std. on ground on either side. T in left field, F in right field. PTR in exergue. UNLISTED BUST TYPE Similar to bust type I1 l. which is not attested for obv. legend 7b (p. 189). Apparently an ancient imitation. Could be noted before TRIER 290. Weight 2.90 g; diameter 19 mm. Coin sold on VCoins (Victor's Imperial Coins) for $75. 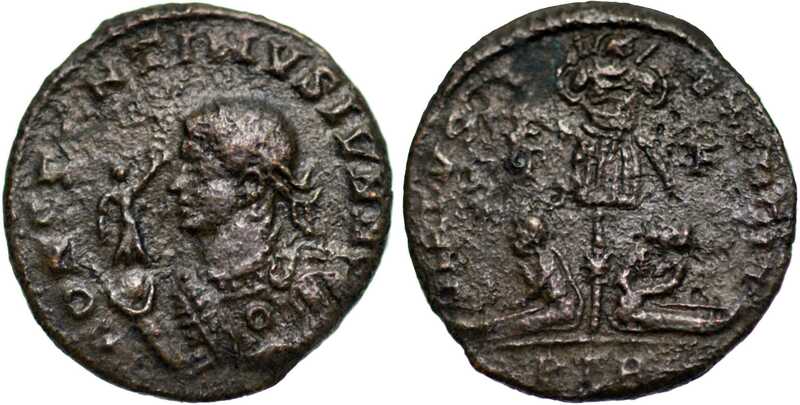 - sold on VCoins (Victor's Imperial Coins) for $75; weight 2.50 g; diameter 19 mm [click for picture].